warning: Creating default object from empty value in /home/mbtn/beta.metsbythenumbers.com/modules/taxonomy/taxonomy.module on line 1418. The Mets are hitting the leftovers like the day after Thanksgiving. Only hours after posting the numerical roster below, one number, 35, came available again when the Mets claimed outfielder Jason Pridie from Minnesota with a waiver claim and designated pitcher Jack Egbert for assignment. Egbert joined the Mets roster late last season when they claimed him off waivers from the White Sox, fulfilling the destiny of all baseball players on the downside of their careers from the tri-state area. Anyway, Pridie, a potential challenger for innings in center field, is in and not yet assigned a number. The Mets were hardly done, it turned out, signing former Met Mike Jacobs to a minor league deal and a chance to pressure incumbent Daniel Murphy at first base. There's been some speculation that Jacobs would take his old No. 27 and leave Nelson Figueroa to search for a new uni, but I doubt that comes to pass. Jacobs hasn't really earned any equity in 27 and I think he's a longshot to be anything more than a Buffalo Soldier this year, as attractive as ability to punish mistakes by righthanded pitchers is. He could really help his cause by taking up catching again, though. My guess is he takes Egbert's 35. Also new to the NRIs is Tokyo Giants lefty Hisanori Takahashi (no relation to Ken as far as I know). This Takahashi could land in the vacant No. 21, that was his jersey back East. Ex-Rays catcher Shawn Riggans, like Jacobs a shaky defensive player with power, accepted an invite and looks to me destined for 73 or 76. The good news is that Mike Pelfrey feels his bout with tendonitis is behind him. The bad news is that it cost the Mets two pitchers to cover his one missed start. Yesterday word came that sidearming Rule 5 draftee Darren O'Day was claimed by the Texas Rangers, wholike the Mets are now required to keep him on their roster all year or -- like the Mets -- risk losing him on a waiver claim. O'Day was designated when the Mets recalled Nelson Figueroa take Pelfrey's start Sunday. Figgy was subsequently designated following his start in favor of Casey Fossum -- and with the gruesome twosome of Perez and Maine following him in the rotation, avialable long relief was handy. Figueroa like O'Day was subject to waivers but went unclaimed. Nevertheless he refused a return engagement with Buffalo and declared free agency, today's Daily News reported. All this -- Maine and Perez's awful starts in St. Louis this week included -- may eventually hasten the arrival of Freddy Garcia, who started his first game this week in Buffalo. With Mike Pelfrey skipping a start with forearm tendonitis, this afternoon's series finale against the Brewers will be started by Nelson Figueroa, recalled from Class AAA Buffalo. Figueroa's arrival -- along with his entire family in a luxury box, you figure -- required the Mets make a corresponding roster move which could cost them sidearming reliever Darren O'Day for the long term. Rule 5 of the draft -- or the mechanism with which the Mets acquired O'Day last winter -- stipulates that O'Day must first be offered back to the Angels for cash. The Angels could also ask the Mets to trade soemthing for O'Day. If neither of those options are selected, O'Day will be exposed to waivers for any team to select. And if not selected there, he'd become a free agent, a la, Rocky Cherry, and sign on with anyone he chooses. Obviously you hope it doesn't come to that although it's hard to argue O'Day over his first few appearances merits the sacrifice of any of his teammates either. I thought we'd seen the last of Nelson Figueroa, but back he came Wednesday night as reinforcement for a Met bullpen that also looking like it might never recover. His recall forced Argenis Reyes to head back to New Orleans, though it is certain he will back when rosters expand Monday. Also returning is catcher Robinson Cancel, activated as Ramon Castro hits the DL with a quad strain. How did Cancel ever get ahead of Raul Casanova (hitting well in New Orleans) in the pecking order among lumpy veteran backup catchers? Speaking of veteran longshots, lefty reliever Ricardo Rincon has been returned to the Mets organization after spending the summer on loan to the Mexico City Reds. Rincon, noted for having worn No. 73 wherever he's pitched, joins the list of candidates to join the beleaguered bullpen as well. So disregard the nonsense about Adam Bostick and Willie Collazo and Joe Smith below -- the Mets on Tuesday afternoon abruptly changed course and recalled Claudio Vargas to the big club, along with Fernando Tatis, and re-activated reliever Matt Wise while designating both Nelson Figueroa and Jorge Sosa for assignment and putting outfielder Angel Pagan onto the disabled list. While we applaud the Mets for being brave enough to sacrifice two players whose backstory (Figueroa) and contact (Sosa) might have won them chances better performing teammates might not have been given, the real story here is how the Mets will outfit Claudio Vargas -- the lefty released by the Brewers this spring -- in the same No. 39 jersey that injured prospect Jason Vargas was issued this spring (Jason Vargas wore 43 in his brief appearance last year). The newly arriving Tatis meanwhile will become the 29th wearer of the 17 jersey. Wise was and still is No. 38. Both Figueroa and Sosa appear to have vanished from the Mets plans following respective poor performances Monday. MLB.com reported that the Mets were trying to trade Sosa -- they had during spring training as well -- and if he goes we'll remember him as the one spot-starter not to completely destruct in 2006. Figueroa and his luxury box full of Coney Island friends and family had a few nice starts before reminding us why he'd been without a big league job for so many years. We may see one or both back eventually -- Raul Casanova, after all, cleared waivers Tuesday and he's had as good a year as either of them. So this is turning out to be a better week than it looked like it might be back on Tuesday, what with an impressive debut starts from Mike Pelfrey and Nelson Figueroa; the first Metly appearance and contribution from Raul Casanova; and a continued MVP bid from Angel Pagan. There's something satisfying knowing that all these guys are one-time products of the maligned Mets farm system. Figueroa's victory last night marked the first appearance of the dreaded black unis all season (not to mention the first call for a tailor to get Figueroa's jersey to fit right. Looked like a size 44 wearing a 52). Correct me if I'm wrong, but we've yet to see pinstripes and/or the gorgeous all-blue Mets cap yet. Speaking as a neighbor of hundreds of young hipsters, the latter is becoming the new trucker cap around here: I'll try and gather photographic evidence and show you in a future post. Nice to see the Mets honor Shea (that's my wife's maiden name, doncha know?) but leave it to the incomparable Paul Lukas to point out they did so while introducing unnecessary black dropshadows to the logo and accompanying retired numbers. * Thanks to Eric Simon of Amazin' Avenue (and his readers) for the enthusiastic book review he published recently. See also a nice note from author, reviewer and Yankee fanatic Harvey Frommer. And Mark Lelinwalla of the NY Daily News did a short peice on the book's creation in The Score column last week. * I'll be at two great independent bookstores next week to sign and discuss the book: On Wednesday, Bookends in Ridgewood, N.J.; and Thursday at Word Books in Greenpoint, Brooklyn. Just as expected, Pedro Martinez's strained hammy landed him on the disabled list today. He's expected to return in 4-to-6 weeks, or months, or whatever, and Nelson Figueroa was recalled from New Orleans to take his spot on the roster. What was unexpected was seeing Figueroa try out the No. 27 jersey so soon by throwing a pressure-free scoreless seventh inning in a 13-0 laugher over the hapless Marlins: A game providing much needed relief from the black mood I walked around in all day considering Tuesday's debacle. The Mets emptied the bench of all but Raul Casanova, including the season debuts of Damian Easley and Brady Clark, and pitchers Pedro Feliciano and Billy Wagner. The first shots of Figueroa in the bullpen also confirmed Mean Gene's remark in the comments section the other day that catching instructor Sandy Alomar Jr. had switched from the 90 he wore in spring training to 58. This was despite the opening ceremonies annoucing him in 90. Don't forget the Mets by the Numbers book talk and signing at Barnes & Noble in Bayside 3 p.m. Saturday and the launch party at STOUT NYC this Sunday at 1 p.m. Hope to meet you there. I’m almost too cranky to post this but seems that Pedro’s shocking injury will lead him to the disabled list and trigger the first roster move of the young season. Reports this morning say Nelson Figueroa will be recalled and ought to get at least one turn in the rotation before Orlando Hernandez is eligible to come off the DL – provided he’s healthy. Figueroa suited up this spring in No. 27, most recently belonging to Carlos Gomez, hero of the Twins’ opener. Gomez of course was badly miscast as 27 and looks sleeker and more confident in 22. Lastings Milledge in typical overconfidence kept No. 44 and Paul LoDuca is still wearing 16 in Washington. I think of 27 as a pitcher’s number — it was Swan, Cardwell, Oliver, Harnisch — and now Nelson Figueroa. I’m confident we’ll see No. 45 again in time potential employers he’ll be a free agent this offseason but until then we'll just have to do without. 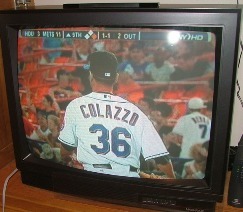 Props to sharp-eyed Met fan Chris who not only pointed out Friday night that Met reliever Willie Collazo made his Shea Stadium debut in a jersey that spelled his name incorrectly, but thought to take the accompanying photo of it. The goof — one too many Z’s and one too few L’s — appeared on the snow-white jersey Friday. 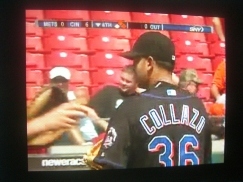 No sooner had we inquired as to whether Collazo appeared in a misspelled road jersey in his debut Wednesday in Cincinnati than Lundy came through with the other photo illustrating he hadn’t. How did Collazo turn from Puerto Rican to Italian? We”ll try to investigate. So thanksagain to Chris and Lundy, to whom we all owe a cold frosty Rheingold. You will often find those guys at the Crane Pool. Other than featuring Collazo’s misspelled jersey — and his second consecutive scoreless relief outing — tonight’s convincing victory over Houston featured the return of rookie outfielder Carlos Gomez 27. The Mets have also reactivated Sandy Alomar Jr., who has continued to dress in No. 19. As you probably heard by now, overmatched rookie outfielder Carlos Gomez 27 injured a bone in his hand in Denver and underwent surgery that will likely sideline him until September. In his place for the time being is utilityman David Newhan 17, recalled from New Orleans last night. Though his inexperience was exposed at times, CarGo on balance acquitted himself well while pressed into duty. He leaves behind the impression of a ballplayer who’s going to be good — someday. Ironically, speculation is that Gomez’ injury will give another shot to Lastings Milledge, who like Gomez, showed flashes of potential and moments of inexperience during emergency service last season. Milledge might have gotten a shot sooner this season but has been rehabbing injuries of his own in the minor leagues. Just a guess here but No. 44 will be in left field when the Mets return from the All-Star break Thursday. I mean, were you expecting Moises Alou?